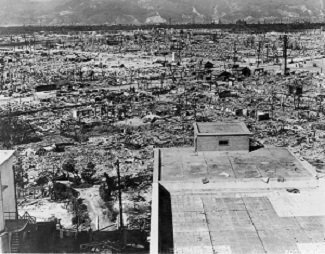 On August 6 and August 9 the Americans dropped atomic bombs on Hiroshima and Nagasaki. 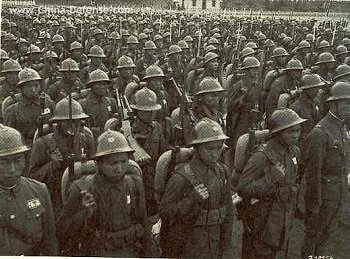 By August 14 the Japanese surrendered, bringing to an abrupt end the 1937-1945 Sino-Japanese War and WWII into which the Sino-Japanese War had been subsumed. The Kuomintang (KMT) – also called the Nationalist Party – led by Chiang Kai-Shek was exhausted by the war effort. Inflation, poor management, harsh conscription policies and battle fatigue had also seriously civilian support for his regime. In contrast, the Chinese Communist Party (CCP) came out of the war stronger than before. After having been almost wiped out by the Long March in 1935, the communists in Yan’an led by Mao Zedong now controlled 1 million square kilometers of land populated by nearly 100 million people. The CCP also had almost a million party members and a million Red Army soldiers. As importantly, the communists had developed a reputation for honesty, for showing real concern for the Chinese people and for efficient governance. 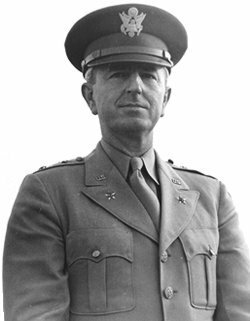 General Wedemeyer, commander-in-chief of the American forces in the China-Burma-India theatre, warned Washington in 1945 that if peace came swiftly to China, there would be extensive disorder as the KMT had no national reconstruction plan. Moreover, Wedemeyer told Washington KMT authority would continue to be seriously challenged by growing communist strength, by a disillusioned populace, by chronic economic mismanagement and by continued alliances with self-interested warlords. After WWII ended, the US tried to shore up KMT strength by air-lifting KMT troops into position to accept Japanese surrender to prevent the CCP from taking command in as many areas as possible. 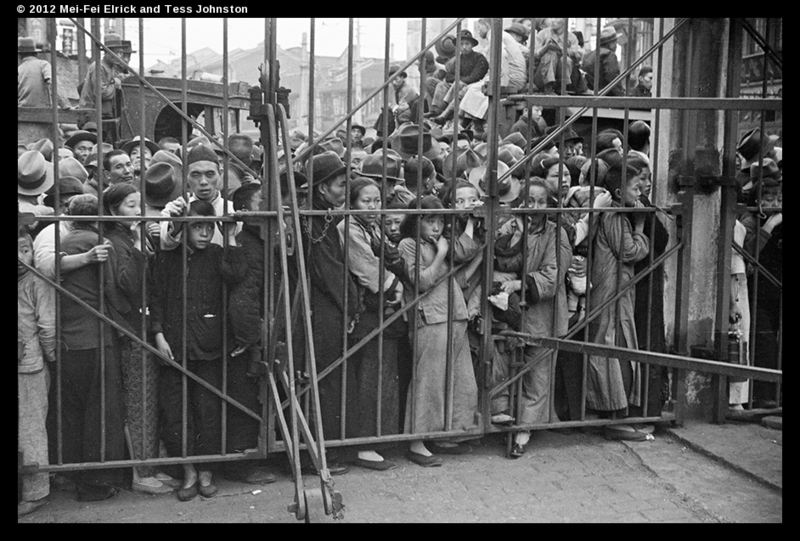 The US also continued to provide Chiang Kai-Shek’s government with military and financial aid. US envoys such as General George Marshall also worked to negotiate a power-sharing truce between the KMT and Communists in the form of a democratic-oriented government with an elective assembly. Yet, as Marshall mediated to create real power sharing between the various Chinese political parties, China moved closer to all-out Civil War. 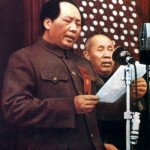 By January 1947, the US disbanded its mediation liaisons and withdrew from involvement in China, much to the shock of Chiang Kai-shek who believed that the US would never abandon its country to communism. Chiang Kai-shek failed to believe that the US would be willing to replace China with Japan as the keystone of its East Asian policy. 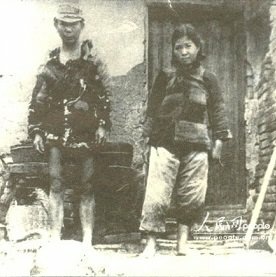 In the early stages of the Civil War, the KMT seemed to have all the advantages. Not only did it out number the communists 2 ½-1 in terms of men and equipment, but it was also receiving military and financial support from the US. An early string of KMT victories between July and December 1946 seemed to bear this belief out. Indeed, in March 1947 the GMD captured the Communist wartime base in Yan’an. However, abuse of power, crushing inflation, and poor military strategy soon turned the KMT advantage. By mid-1947, the KMT military machine began to founder, while the Communist army continued to expand in numbers. Chiang Kai-shek’s initial string of victories soon turned to losses. Between September 1948 and January 1949 the KMT lost 1.5 million men to death, injury, desertion and surrender. Faced with such overwhelming troop losses, the KMT defence collapsed in mid-1949. 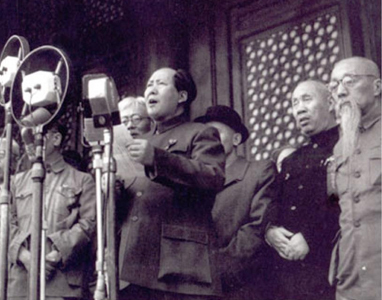 On October 1, 1949 Mao declared the founding of the People’s Republic of China. Meanwhile what remained of the KMT government retreated to Taiwan, taking with them huge quantities of dynastic art and most of the nation’s supply of gold and silver. After the Japanese defeat, the US supported Chiang Kai-shek by airlifting close to a half million of Chiang Kai-shek’s troops to key cities in order to accept Japanese surrender in advance of the Communists. It also placed 50,000 American marines in the key ports and communication centers to await the arrival KMT troops. The scale of the surrender was immense and took months. 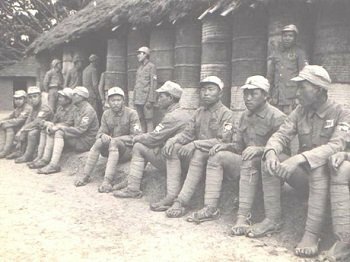 Over 1.25 million Japanese soldiers, 900,000 and 1.75 million Japanese civilians had to be disarmed and transported from the country. 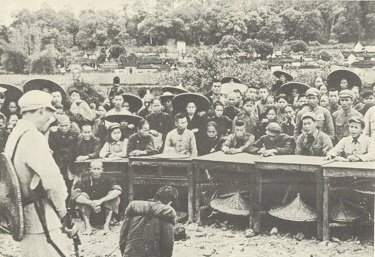 For its part, the CCP ordered its troops to seize as many Japanese-occupied towns, cities and communication centers as possible, receiving their surrender and their military supplies. Communists efforts were not supported by the Americans and were strongly opposed by the KMT. Indeed, often the Japanese were instructed to continue to fight the CCP until the KMT could move into position. In Manchuria, Chiang Kai-shek asked Stalin to hold the province until the KMT could assume control. Yet, the CCP were well positioned geographically in the north, especially for Manchuria. 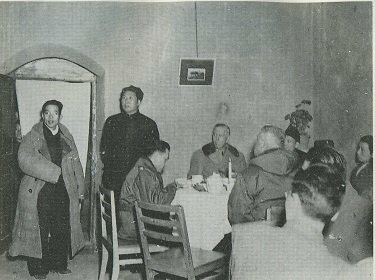 Not only was Manchuria relatively close to their northern Shaanxi base, but it also had an active underground communist movement that rapidly resurfaced. Despite being ravaged by years of fighting, Manchuria remained a good prize. It was rich in resources, and had a developed industrial base, large cities, good food stores and a hilly and forested topography that would allow protection for communist guerrilla forces. On August 11, 1945, CCP leader Lin Biao led a 100,000 man army along the Beijing-Mukden Railway into Manchuria. 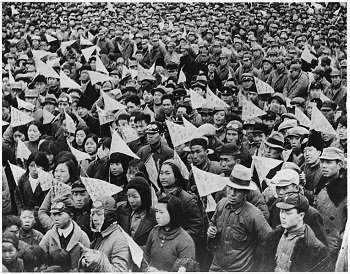 They joined up with 150,000 People’s Self-Defense fighters organized by the re-surfacing Manchurian communists. Many of the People’s Self-Defense fighters were either native Manchurian or Koreans who had fled during the Japanese invasion of their country. In the weeks after the Japanese surrender, the CCP extended their territory from 116 to 175 counties. The communists fighters also successfully secured the industrial city of Harbin with a population of almost 800,000 people, giving it its first urban base since the Northern Expedition. Their efforts were helped by the Soviets who – when not busy stripping Manchuria of food, gold and equipment – allowed the communists to take hold of large arms and ammunition stores. Yet the Soviets did not set up the CCP to takeover Manchuria. Instead, Stalin insisted that the communists negotiate with the KMT to form a coalition government. Despite Stalin’s ideological proclamations of international communist revolutions, Stalin’s real-politic objective was to keep China weak so it could be used as a platform to expand Russian influence in East Asia. Despite CCP success in Manchuria, overall the KMT was better positioned by the time the dust settled after the Japanese surrender. The government had retaken control of almost all important cities in communication centers in central, east and southern China. The KMT had a men and materials superiority of 2 ½ – 1, the support of the Sino-Soviet Treaty of Friendship and Alliance, as well as the backing of the US – the most powerful country in the world. Because of what he believed to be his overwhelming advantages and because Chiang was confident he could now destroy the communists once and for all, Chiang made the ill-fated decision to send almost a half million troops of his best troops to Manchuria despite American advice that he should first consolidate his control south of the Great Wall. 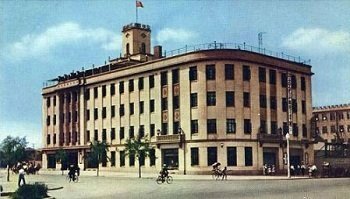 The CCP’s control of industrial city of Harbin marked the first time since the beginning of the Sino-Japanese War in 1937 that the Communists had a large base in an urban environment. Their experiences there were to prove important once the Civil War began to expand communist power southward. To facilitate the task of urban government, the CCP divided the city into six districts which were further divided into 58 street governments each overseeing a population of approximately 14,000 citizens. Once in control, the CCP launched registration campaigns, arrested thieves and other “destructive elements”, organized citizens into self-policing organizations, and employed urban workers to assist the PLA in transporting goods and wounded soldiers from the various fronts. The CCP also worked conscientiously to restore order to the economy. They kept prices low for fuel, grain and cooking oil, but instituted more punitive taxes for tobacco, cosmetics and luxury goods. They also taxed businesses. 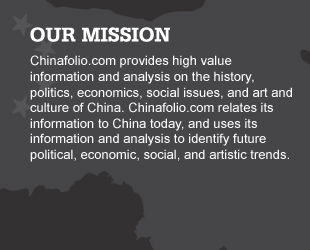 Additionally, they launched a so-called Voluntary Contribution Campaign; using mass media, public meetings and coercion, the CCP succeeded in raising an additional 200 million yuan to fund its fighting. Once again, CCP economic and government policies contrasted sharply with KMT practices in Manchuria. The KMT formed alliances with hated Japanese collaborators or had their cronies displace local officials. The new KMT leaders would then often use their new posts for self-enrichment. 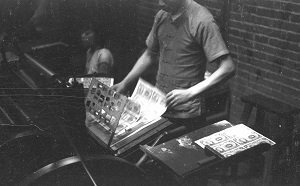 Rocketing military expenses and economic mismanagement again forced the KMT to print money, fuelling inflation, despite the KMT’s efforts to isolate Manchuria from China’s national surging inflation by introducing its own Manchurian currency. Despite American assistance at the beginning of the war, the KMT quickly started to fritter away their authority. To begin with, the KMT were militarily, financially and spiritually exhausted. This exhaustion gave them little bandwidth to tackle the corruption and economic mismanagement that had plagued the party throughout its time in power. They also undermined their popular support by forming alliances with dodgy warlords, including many known Japanese collaborators. Even when anti-Japanese collaborator regulations were implemented in September 1946, loopholes allowed many to escape punishment and receive appointments, much to the outrage of the Chinese public. 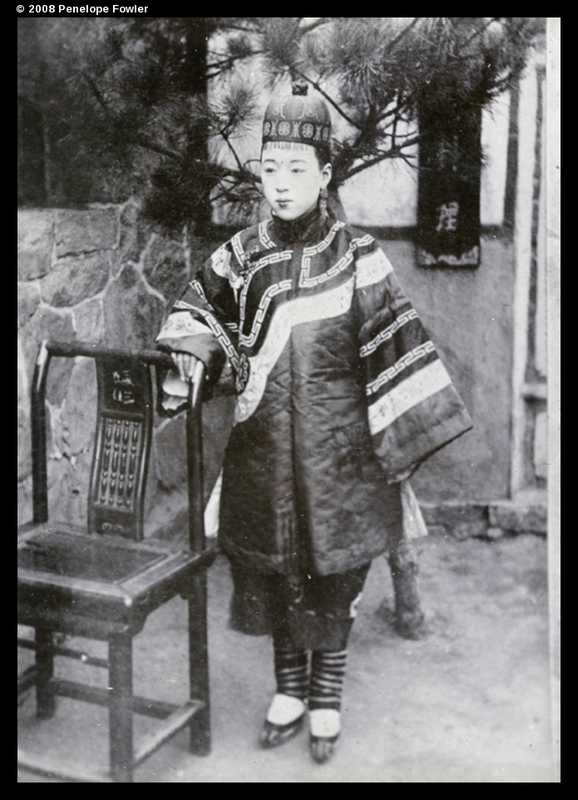 Abuse of power and scandal became widespread, often relating to the return of property confiscated by the Japanese during their Chinese occupation. Disputes forced factories and business premises to remain closed longer than had been promised, throwing people out of work and further weakening local economies already ravaged by war and inflation. Unemployment rose. A reduction in defense spending and some demobilization increased unemployment figures further. Equally corrosive was Chiang Kai-shek’s poor management of the national currency and the money supply. During the war, exchange rates and even currency varied by region. Many of the Japanese-puppet regimes had issued their own money. After the war, currency speculation became rife. Making matters worse was the persistent budget deficit. This meant that the KMT were constantly short of money. The knee-jerk response to this shortage was to print banknotes which resulted in catastrophic inflation. Wholesale prices, for instance, increased 30% per month from 1945-1948. Anyone on the fixed salary was hit hard. Soaring inflation destroyed the livelihood of hundreds of millions of Chinese. Industrial workers, for instance, had their purchasing power sharply eroded. They began to strike in protest, encouraged by underground Communists who again began to infiltrate workers’ unions. The KMT tried hard to negotiate with workers in order to avoid more conflict, offering, for instance, wage rates based on 1936 pay scales which were then multiplied by a current cost of living index; this, in turn, displeased employers who felt that the higher wages eroded Chinese competitiveness. When the new wage scheme proved ineffective, the KMT instituted price and wage ceilings, setting prices for rice, flour, cotton, cloth, fuel, salt, sugar and edible oil and locking wages into the January 1947 cost of living index. These controls had some effect through March 1947, but hoarding, inadequate enforcement and distribution problems eventually caused inflation to return. By May 1947, the price and wage ceilings were abandoned. Even a July 1947 American plan to distribute food and fuel at low prices through the Central Bank of China did little to halt inflation’s rise. In a last-ditch and ultimately unsuccessful attempt, the KMT issued ration cards for staple foods to urban citizens. Facing an increasingly serious crisis which was quickly wearing away their power base, in July 1948 Chiang Kai-shek and his financial advisor T.V. Soong decided to introduce a gold yuan, abandoning its current currency. Soong and his other financial advisors warned Chiang Kai-shek that the currency would not hold unless the deficit was dramatically reduced, which in turn would mean that military spending would have to be cut. They had also hoped to support the new currency with loans from the US which they were unable to secure after Truman was re-elected in 1948. In order to increase confidence in the gold yuan, the KMT committed to printing a maximum of 2 billion yuan worth of notes. To support the currency further, wage and price increases were banned as were strikes and demonstrations. Sales taxes were increased to raise more revenue. All gold and silver bullion held by Chinese citizens were to be turned over to the banks (although many were reluctant to comply.) Yet, despite the KMT’s efforts, the gold yuan also failed. By October 1948 inflation returned, along with shortages of food, goods and medical supplies. Barter began to flourish in the absence of functioning monetary system. KMT soldiers too were battle-weary. 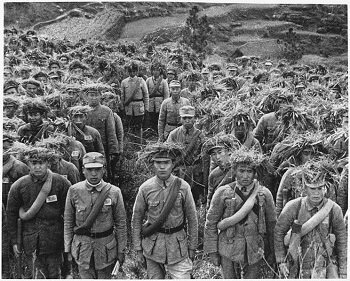 Patriotism and the ever-growing prospect of victory gave the KMT troops the energy they needed to fight to the end of the Sino-Japanese war. Relieved, proud, the often-gang pressed troops now wanted to return home for a much looked-for rest. They had no desire to launch into a Civil War to fight against their own people. They especially had no desire to be sent to Manchuria where the local population and the terrain was unfriendly and unfamiliar. 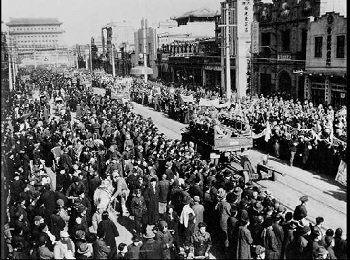 Despite the KMT’s economic and military challenges, Chiang Kai-shek proceeded with plans to destroy the communists once and for all while the Americans worked actively to create a KMT-CCP power-sharing truce that would avoid civil war and that would install some form of a democratic-oriented government which shared power through an elective assembly. In August 1945, Ambassador Hurley accompanied a reluctant Mao Zedong from Yan’an to Chongqing to negotiate with Chiang Kai-shek. Despite the KMT’s apparent strength, Mao Zedong was confident that the CCP would eventually control a large area north of lower Yangtze and Huai Rivers, yet he also believed that securing the territory would take time. Given that he was outnumbered both in men and arms, Mao adopted a flexible and constructive negotiating position during the talks in order to buy the communists time. These initial talks lasted until October 10 and resulted in the publication of what seemed to be a collaborative set of tenets including the need for: political democracy, freedom of religion, speech, assembly, publication and person, an integrated military, and equal legal status for all political parties. A People’s Congress or National Assembly was to be called. Yet undermining these public agreements was the fact that Chiang Kai-shek intended to a reassert KMT control over the entire country where, at the very least, Mao and the communists intended to hold on to the territory currently under its control. Given this, much of their promises were to prove empty including the agreement to integrate their military forces. While the CCP did pull their troops out of southern China, they consolidated their hold over their territories in the north. 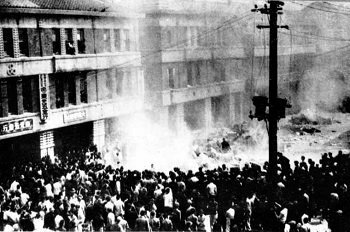 In November 1945, the KMT attacked the CCP in the north. Zhou Enlai, who had remained in Chongqing to continue negotiations, returned to Yan’an and Ambassador Hurley unexpectedly resigned. 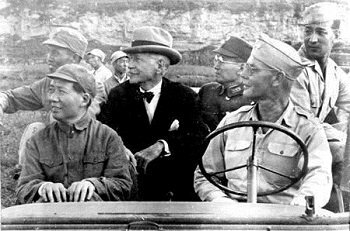 Still earnest in his desire to lead China onto a peaceful and democratic course, Truman sent General George Marshall as his envoy in December 1945. Marshall achieved a cease fire in January 1946, and got Chiang Kai-shek to agree to convene the People’s Congress as had been agreed during the August-October 1945 talks. Thirty-eight delegates, representing all of Chinese various political parties, assembled in Nanjing between January 11 and January 21 where they appeared to reach accord on the framework of a constitutional government, of a unified military command and of a national assembly. Yet despite these accords, military clashes between the KMT and the CCP recommenced. Buoyed by a string of military victories, in July 1946 Chiang Kai-shek convened his own National Assembly in open disregard to the original agreement that no such Assembly should be called until all political parties first formed a coalition government. The CCP and the Democratic League boycotted the illegal assembly in protest. In a move reminiscent of Yuan Shikai’s efforts to take control of the National Assembly in 1914, Chiang Kai-shek proceeded without multi-party support, drafting a constitution that would cement his control of power. 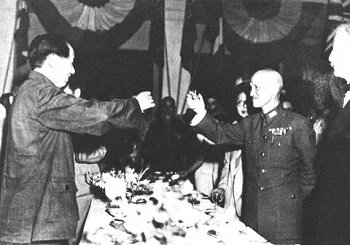 In June 1946, General Marshall again got the KMT and the CCP to call a halt to their fighting – particularly heavy in Manchuria – and to return to the negotiating table. He pressed both sides to reopen the railways which were a key to the country’s distribution system. Yet, even as these discussions were occurring, the KMT was organizing a second assault on CCP positions in Manchuria to be launched in July. The CCP, in turn, were hardening their position. They refused joint military leadership, declined to give up any territory that they controlled and refused to have dictated to them which policies they could implement within the territory that they governed. The CCP were also increasingly suspicious of American intentions. In their base areas, they began to voice anti-American propaganda about how the Imperial Americans were once again interfering in Chinese politics. In July 1946, the communists attacked an American supply convoy, killing four American Marines and wounding a dozen others. In the face of renewed fighting, President Truman told General Marshall that the Americans would not support China if it dissolved into Civil War. He also re-articulated this in an August 10, 1946 letter to Chiang Kai-shek. Truman warned Chiang that if his positions did not become more flexible, American support would end. He encouraged Chiang to “outflank” the CCP through economic and social reforms instead of trying to crush them militarily. Yet, the KMT had always drawn its power from urban centers and from their business elite. It still paid little attentions to agrarian problems and remained largely unsympathetic to the peasants’ plight even though the peasants represented the overwhelming majority of the Chinese citizens. Chiang thus failed to recognize the revolutionary potential of the peasant masses. He never made any efforts to organize them for himself or to neutralize them with land and social reforms. Instead, for the most part, he continued policies that forced them into submission when the need arose, without ever considering what was making peasants revolt in the first place. Chiang Kai-shek also believed that the United States would never let China fall to the communists. It was true that the United States wanted to establish a new balance of power in the Pacific and East Asia in which it could play a dominant role. Such a policy required a strong alliance with either China or Japan. That said, the US’s first priority was to rebuild Europe. 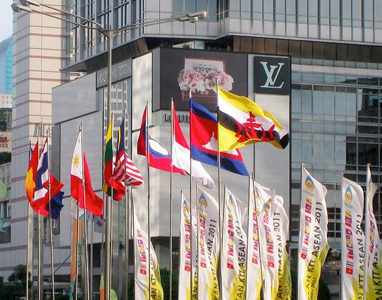 Because of this, it wished to achieve its East Asian goals as inexpensively as possible. As China began to spiral into Civil War, the US began to look to Japan as a better and cheaper option on which to build its East Asian strategy. By January 1947 Truman reached the conclusion that the KMT and the CCP were determined to fight it out. Truman had no intention of embroiling US troops in a Chinese civil conflict. US mediators were recalled. When Truman stole the election from Dewey in 1948, it was the nail that sealed the end of significant US engagement in China. The KMT had carefully cultivated relations with the Republican Dewey who had said that, if elected, he would extend massive aid to the Chinese. Truman showed no such inclination. After his election, he twice turned down KMT requests for aid in November and December 1948. While American-led negotiations were occurring through 1947, the communist leaders moved from a land reform policy based on rent reductions and graduated taxes to a more aggressive policy of land redistribution and the eradication of tenancy in the areas that they controlled. 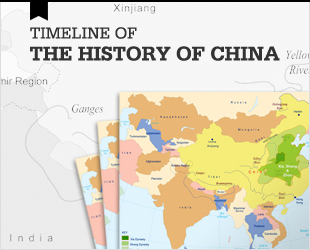 The CCP were particularly active in launching this land reform policy in its original war-time base of Shaanxi, northern Jiangsu, and parts of Hebei and Shandong. The Communists efforts were most successful in areas ravaged by Japan’s Three All Policy as well as those provinces destroyed when Chiang Kai-shek broke the dikes of the Yellow River. In these areas, the Communist message of a new, fairer social order resonated with peasants mired in poverty. Also, years of fighting had weakened the peasants’ traditional social loyalties such as those to their lineage and religious associations. Often now, their villages and provinces were commanded by appointed officials whom the villagers considered nothing more than bullies and bandits. Mass peasant engagement and violence became elemental to the land reform process. Mass meetings were used to unleash the anger of peasants against their wealthy landlords. These landlords were then subjected to public humiliation, beatings and even death while the peasants confiscated their land and often their food and wealth. Some of these land redistributions were temporarily reversed when KMT troops recaptured territory. In these instances of restored power, the KMT and landlords retaliated harshly. 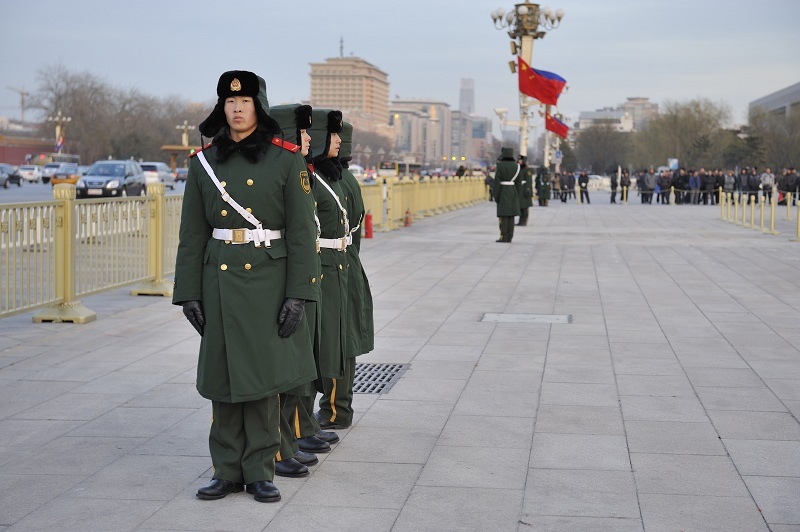 With land and other reforms in communist controlled areas now set in motion, Lin Biao began to transform the PLA into a conventional fighting force, moving away from the guerrilla tactics that had been the communist modus operandi up until now. On May 1, 1946 the CCP renamed the Eight Route Army and the New Fourth Army the Chinese People’s Liberation Army (“PLA”). Lin Biao employed his new methods successfully by repulsing a KMT attack on Harbin. 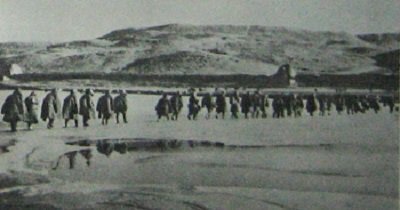 Then, in November 1946 he crossed the frozen Sungari River and attacked KMT troops in their winter base. Lin Biao continued to strike across the river throughout their early months of 1947, and then in May 1947, he launched a massive attack on the railway junction of Siping with 400,000 troops. Defeated by the KMT who were backed by air power, Lin reorganized his forces and then surrounded and isolated several key Nationalist-held Manchurian cities by cutting off rail access which was a major line of supply. The KMT’s fighting spirit eroded. In particular, KMT troops were demotivated by the disparity between their poor pay and that of the officers’ who often used their positions for self-enrichment. KMT troops in Manchuria were quickly adopting a siege mentality, digging in behind defensive lines instead of trying to proactively attack the CCP whose troops were buoyed by many native Manchurians who felt they were fighting for their homeland. This effectively allowed the CCP complete control of the Manchurian countryside. By May 1948, the position of Chiang Kai-shek’s troops in Manchuria was turning increasingly desperate. This was all the more important because Chiang had concentrated many of his best troops there, without having first consolidating military and civil control of the South. 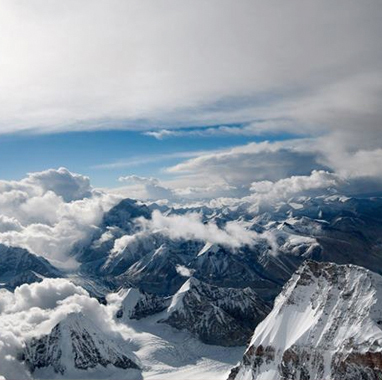 The KMT strongholds of Changchun and Mukden could now only be supplied by air. Yet Chiang Kai-shek had too much invested in Manchuria to listen to his military advisors who proposed that he pull back behind the Great Wall in order to regroup his forces. 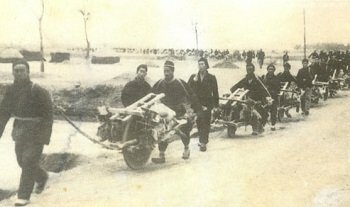 Louyang was captured by the Communist in April 1948, cutting Xi’an off from the East. Subsequent CCP victories in Shandong isolated 100,000 KMT troops in Jinan. Under a separate assault in March 1948, the Communist led by Peng Dehuai recaptured their wartime base of Yan’an which had been taken by Chiang Kai-shek in March 1947. At the city of Kaifeng on the Yellow River – which protected the key railway junction of Kaifeng – the communists pitted 200,000 season troops against about 300,000 KMT fighters. The CCP succeeded in holding Kaifeng for a week before being forced to retreat. Yet the victory cost the KMT lost 90,000 men. 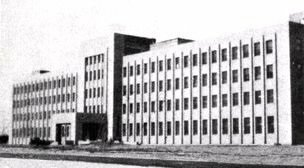 By October 1948, the city of Jinan fell to the CCP due in part to KMT troop desertion and to communist underground activity. This meant that Chiang Kai-shek now lost its last base in Shandong. Also in October 1948, Lin Biao succeeded in capturing both Mukden and Changchun, thus causing the desertion, surrender or elimination 400,000 of Chiang Kai-shek’s best troops. Chiang Kai-shek had been re-elected president in the spring 1948 by the National Assembly which had been boycotted by the CCP and the Democratic League. Yet continued economic, civil and military mismanagement was eroding his popularity. His support suffered further when in July 1948 government forces killed 14 and wounded over 100 students who had fled fighting in Manchuria and who were now living as refugees in Beijing. The students were shot when marching to protest their inadequate subsistence allowance which often forced them to beg in order to eat. On January 21, 1949, Chiang Kai-shek resigned as president, although he remained head of the Kuomintang Political Party. Chiang Kai-shek was replaced with Li Zongren. Having lost Shangdong, the KMT tried to regroup to defend northern China, or if that failed, the center of the country. In late 1948, Zhu De, Commander-in-Chief of all CCP forces, launched a successful 600,000 troop assault on the railway junction of Xuzhou against an equal number of KMT soldiers. In the 65 day battle that followed, the communists showed new skill with conventional warfare by outwitting the KMT generals who suffered from conflicting commands from Chiang Kai-shek and from heavy troop desertions. Deng Xiaoping orchestrated the communists’ logistical support by mobilizing 2 million peasants over four different provinces. Over the same period, Lin Biao captured Tianjin in January 1949. He then moved on to Beijing, convincing the KMT general to surrender. The KMT had lost the north of China. The capture of so many large northern cities threw the communists into urban government as never before. Mao Zedong recognized this in March 1949 when he gave a report stating that the focus of communist efforts would begin to shift from the countryside into the cities while the PLA moved southward on its conquest of the country. In practical terms, their experience in Harbin was to prove invaluable. So was their initial decision to disrupt as little as possible the property and livelihoods of the people in the cities that they captured. To this effect, Chinese businesses were protected, urban property did not change hands, and factories were guarded from looting. 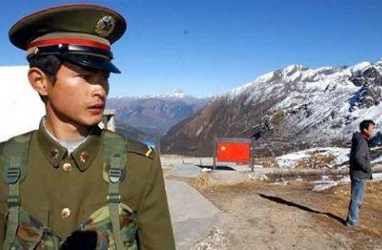 The PLA continued to maintain strict discipline in all the areas into which it moved. A people’s currency- the renminbi – soon replaced the KMT yuan. To try to prevent monetary chaos, only a short window was provided in which the yuan could be exchanged for the renminbi. Thereafter, any exchange in gold, silver or foreign currency was prohibited. Additionally, labor unions were not allowed to strike. 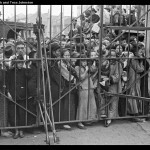 Refugees were fed and repatriated when possible. Educational institutions continued to teach. Stockpiles of food were used by the government to stabilize food prices during times of shortage. By early 1949 the KMT was making contingency plans in the event of the once unthinkable- that communists could win control of the country. In 1945 China had reclaimed Taiwan from the Japanese who had ruled the island as a colony since 1895. When the KMT reinstalled a Chinese government in Japan after the war, the same patterns of KMT corruption and disregard continued. The KMT quickly alienated the local population. 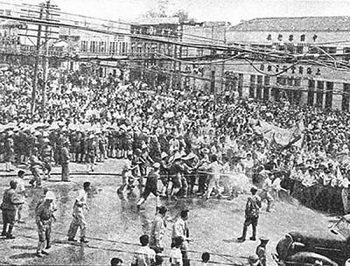 Taiwanese discontent came to a head in 1947 when Chinese troops fired into a group of Taiwanese gathered to protest the shooting of a woman selling cigarettes in contravention to a government monopoly. Over the following weeks, the KMT continued to treat the situation heavy-handedly by arresting and executing thousands of Taiwanese intellectuals and civilian leaders. It eventually imposed Martial Law in order to control the population. By January 1949, the KMT began transporting to Taiwan thousands of crates of Qing Dynasty archives as well as a huge collection of China’s dynastic art taken from the Imperial Palace collection. Chiang Kai-shek also began to steadily build up on the island a force of over 300,000 soldiers personally loyal to him. Li Zongren, the new KMT president, tried to prevent this final retreat by getting Mao Zedong to compromise on his conditions for KMT surrender. These conditions included provisions such as a complete reform of the land tenure system and the reorganization of KMT armies under communist command that were completely unacceptable to the KMT. By April 1949, the Communists gave President Li an ultimatum to accede to their conditions within five days or the communists would attack anew. Nanjing fell on April 23 without resistance. Hangzhou and Wuhan were lost shortly thereafter. Shanghai was taken in May 1949. Xi’an, Lanzhou and Changsha were taken by August 1949. By September the KMT had lost Xinjiang, Suiyuan and Ningxia. By October the KMT surrendered Canton and Xiamen – the last port from which to retreat to Taiwan. By November 1949 Chiang Kai-shek’s wartime base of Chongqing was claimed as communist territory. 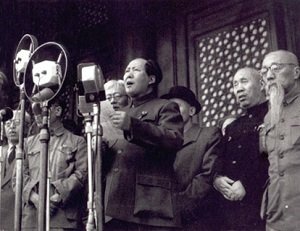 Anticipating victory Mao Zedong convened a Political Consultative Conference in Beijing in late September 1949. The conference was dominated by the CCP while also including representatives from 14 other political parties. At a subsequent ceremony on October 1, 1949, standing atop the main entrance of the Ming and Qing Imperial Palace, Mao Zedong announced the founding of the People’s Republic of China.